It is the first Christmas recipe of the year!! Can I get a WOOOO HOOOO? No, not quite ready for that yet? Okay, I know it is a little bit early for Christmas recipes, with nearly a month still to go, but if you are anything like me, then you want to get your Christmas recipes and meals planned fairly early. So that is the reason why I am posting this now. And because I really love Christmas. There – I said it! I posted this last year, but it was insanely popular and got shared so many times (thank you to all of you that shared it) that I had to repost it again this year for all the new HHH readers and a little reminder to older HHH readers to make these again. 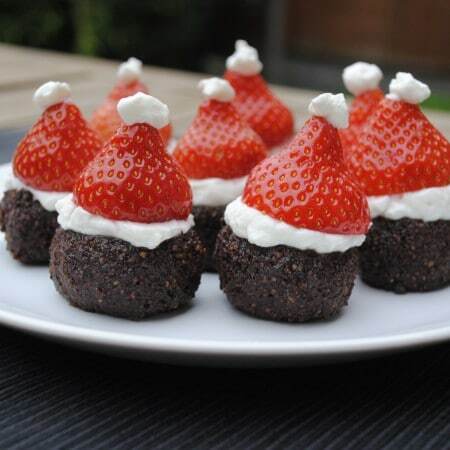 I have seen pictures of these Santa hat brownies all over Pinterest, but after clicking on all of them, they were all made with brownies full of butter and sugar and topped with whipping cream. Whilst I am all for a balanced diet and indulgence every so often, especially at Christmas, I knew I could make these totally healthy, without sacrificing at all on taste. You may recognise the brownie part of this recipe as my old brownie bite recipe – but I have reworked it a little. These brownies are seriously amazing. I can say that about my own recipe, right? They are fudgy and moist and packed full of chocolatey goodness. 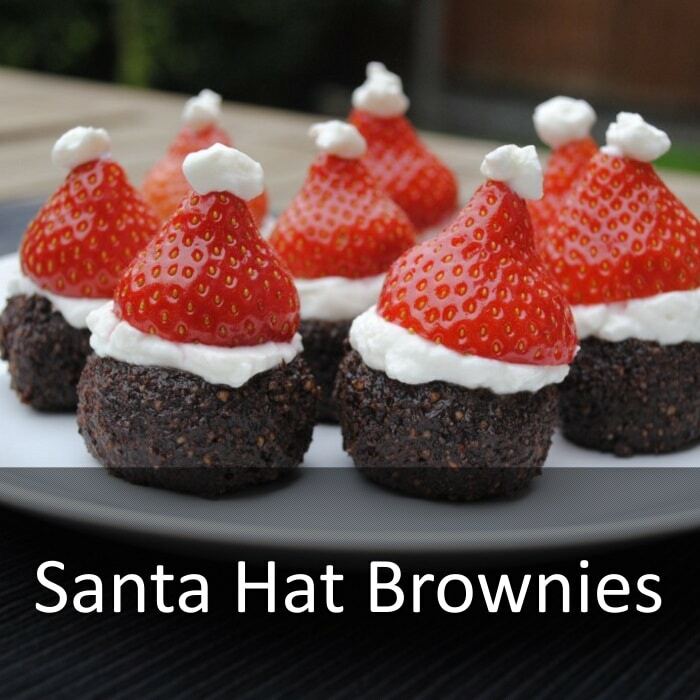 You can even make the brownie part of it in advance and freeze until you are ready to make the whole Santa hats. These are no-bake brownies too! Having a Christmas party? 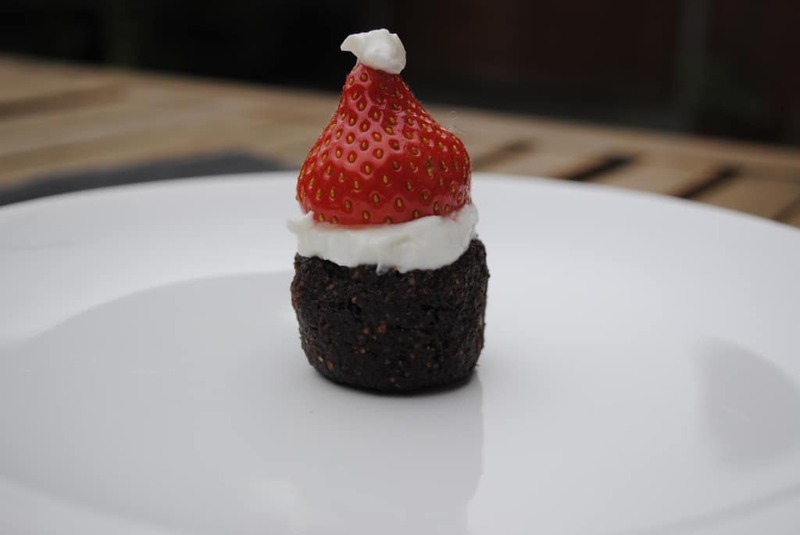 Serve up these Santa Hat Brownies to your guests and they will love the festive theme. blend the almonds until fine. Add the dates and cocoa power and blend until smooth. Tip into a bowl and stir in the ginger, honey and water and mix well. Here comes the VERY messy part, as this stuff will stick to your hands like glue. Divide the mixture in to 12 balls and then form sausage shapes. At the tip of each "sausage", put a hand at each and squash them down so you have a flat top and bottom circle. 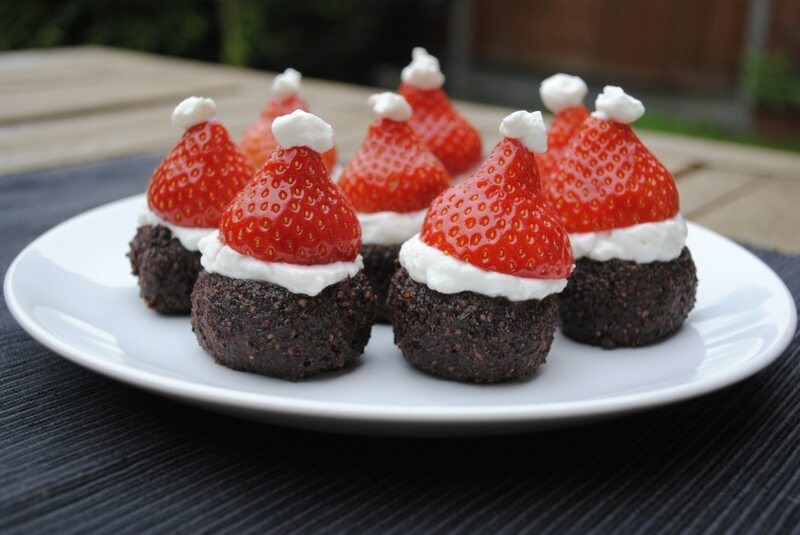 Top each one with a tsp of Greek yoghurt and add the "Santa hat" (strawberry) and top that with a tiny dot of Greek yoghurt. Are you excited that Christmas is here? Leave a comment below. If you make these a day ahead of time B4 your party, what is the best way to store so they will not dry out? Uh oh, mine are too moist, shall I add more almonds/almond meal? Yes, add some more almond meal or cocoa powder. These have a great balance of carbs, protein & fats, plus look great on a party platter! These are SO CUTE! I was just thinking about what holiday treat I can make for family members trying to lose weight, and I think these might be it! These are adorable! I am totally pinning to remember to do this at Christmas. Love the ingredients in those brownie bites. 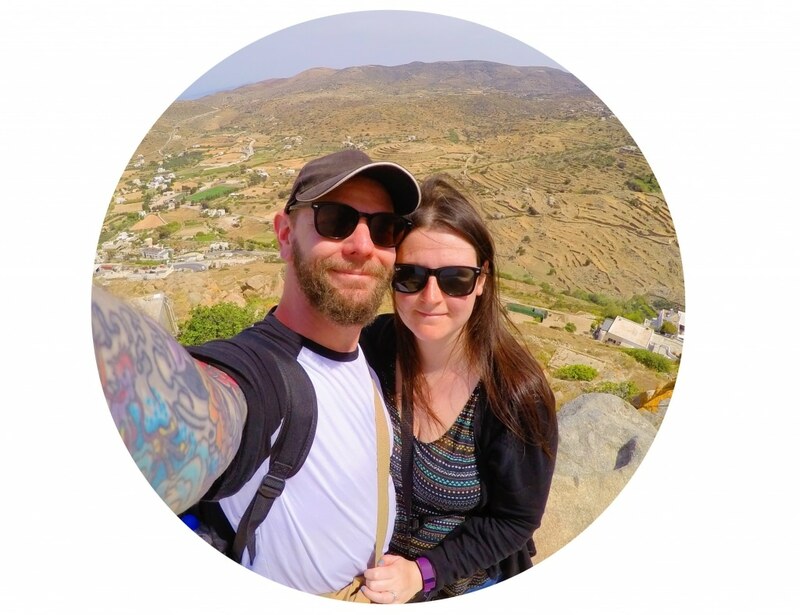 I am with you– why can’t we celebrate holidays with mouth watering clean recipes, rather than use a celebration as an excuse to eat total junk??! I’d rather feel good… and I honestly prefer these types of sweets.